Limogés Jewelry is the premier place to find the perfect jewelry for men. Our bold collection of men's jewelry showcases monogram rings, dog tags, watches, ID bracelets, and much more! We offer a unique line of affordable men's jewelry featuring pieces made of precious metals including cobalt, titanium, tungsten, stainless steel, and sterling silver. 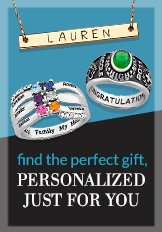 Many of our personalized jewelry for him can be engraved, and are often decorated with birthstones, cubic zirconia crystals, and/or diamonds. Men's wedding bands are also available.